Meet our newest addition – Balihara’s Kaiser Kasper! aka Max! Whelped January 5, 2011 in Slovakia. Max now resides in Sweet Home Alabama! So What is an Entlebucher Mountain Dog? Entlebucher’s are the smallest of the four Swiss Mountain Dogs. In February 2010, the AKC voted to give the Entlebucher full breed recognition and placed them into the Herding Group. Entles began showing in AKC conformation events in January 2011. The four Swiss mountain dogs descended from the molossus dogs brought to Switzerland, by Roman troops, somewhere around 500 B.C. Farmers have relied on these dogs for centuries for their intelligence, strength and ability to help out around the farm. Around the town of Entlebuch, a dog’s primary job was guiding dairy cows up into the mountain pastures in the morning and back to the farm in the evening. To accomplish these tasks they needed a brain, tenacity, agility, limitless energy and fearlessness. 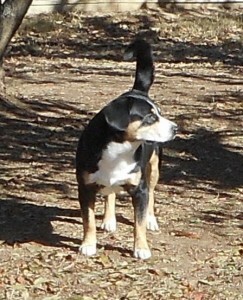 The first Entlebucher came to North America in 1984. Entlebucher leap – If a cow refuses to move, Entles will first nip heels and if that doesn’t work, they’ll leap up and slam into the stubborn cows side. Herding eyes – While watching cows or sheep, the Entle can take a nap in the sun. His fawn colored eyebrows fool the herd into thinking he ‘s awake and watching them so they stay together. For more information and to read the standard, visit akc.org or nemda.org, the breed parent club.